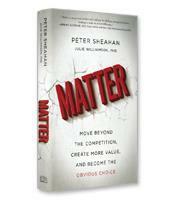 In Matter, Peter Sheahan and Julie Williamson show you how to identify the place where you can create the most value — your edge of disruption — at the intersection of old and new, where your existing profits, reach and reputation enable you to create the markets of the future. This is the place where the most important problems are solved and where the fewest people can solve them. Your edge of disruption is where your opportunity to matter is found. Don’t just read this book — use it to identify and act on opportunities to create the most value and accelerate your own journey to becoming a person and a company that matters. What it means to be a company that matters. The three-step process for becoming a company that matters. How to do the hard work of reinventing yourself, rather than working hard at what you’ve always done. How to make thought leadership a way of life.